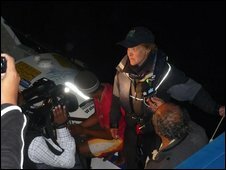 A biologist from Rutland has become the first woman to row solo across the Indian Ocean. Sarah Outen, 24, set off from the west coast of Australia in April and arrived at the island of Mauritius on Monday evening. Crowds lined up to welcome her as a local boat guided her to the island after 124 days at sea. Ms Outen said it was "an astonishing experience" and she had seen the elements "in all their states". After arriving on Mauritius, Ms Outen said: "It's beautiful out there and it's been really exciting seeing the elements in their good and bad states. "In the last days I've have whales surfing past the boat and albatrosses flying overhead."